Lead-acid batteries should not be discharged below a certain point if they are to last. Also, you don’t want certain 12v powered devices, which might be plugged into a car’s cigarette lighter outlet, to drain the car battery down to a point where the car’s engine will not start. To prevent battery damage or a dead battery, the circuit below disconnects a load from the battery when the voltage dips below a fixed but adjustable voltage and will not reconnect the load until a reset button is pressed. To keep the whole circuit efficient and compact, a medium current rated p-channel FET forms the power switch. A 8.2v zener diode forms the voltage reference while a second 15v zener diode acts as a transient voltage protector. The circuit uses one half of a popular LM393 dual voltage comparator to monitor the battery voltage and the adjustable reference voltage. 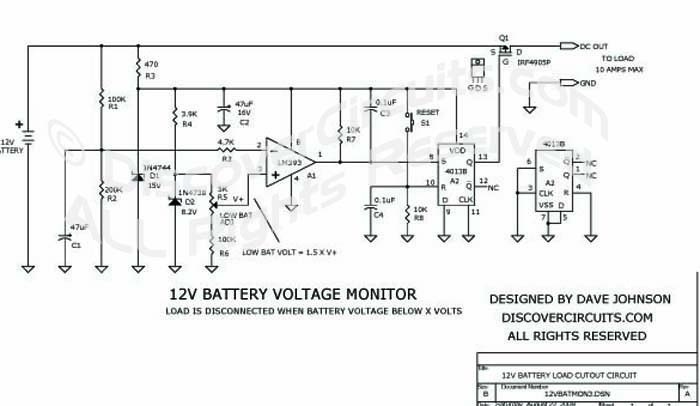 If the battery voltage drops below the adjusted level, the comparator changes state. One half of a popular CD4013 dual flip/flop latches the on/off condition. A reset button must be pressed to reestablish power to the external load. A rather long 5 second time constant filter is used in the voltage comparator circuit. This allows the circuit to ride out the dip in battery voltage, which always takes place when the car’s engine is started.